On a daily basis, librarians support and answer countless questions from students and researchers on the most efficient and effective way to identify and manage reference information. Modern day librarians need to consider not only the scholarly need of citation management but also consider how such a citation management tool can support extensive research collaboration requirements. Therefore, most librarians feel a strong need to keep abreast of the newest researcher tools available in the market. 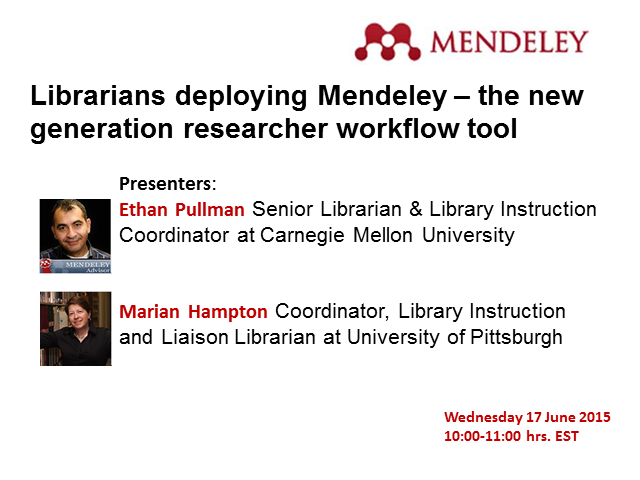 This webinar features librarians from Carnegie Mellon University and University of Pittsburgh discussing why they decided to invest resources in Mendeley and what kind of impact it had in their universities. They will share experiences with previous tools and how research collaboration and data analytics tools in Mendeley support their research objectives as well as shape the researcher services they provide. Learn how Mendeley is being used by researchers at NASA to help alleviate some of their research challenges and why many of the librarians at NASA are joining the Mendeley Certification Program for Librarians. Join this webinar to learn about library partnerships with campus research offices and the role information professionals can play in enhancing research performance. The discussion will then move on to an overview of Mendeley Funding, recently launched on the Mendeley platform, offering researchers and librarians a single repository for the latest grant information and funding opportunities. The topic of Research Data Management, i.e., ensuring that data is stored and distributed correctly and effectively, is on the lips of many institutions and funding bodies; how can librarians leverage today’s tools to address this challenge? Join us for an informative presentation and a demonstration Elsevier’s leading edge RDM tools, Mendeley Data and Hivebench. Why should researchers care about research integrity? After all, they do not engage in any questionable research practices, right? Well, as it turns out, 70% of scientists in a recent survey conducted by Nature Publishing Group think there's a problem with reproducibility or have had problems replicating another researcher's work. In this presentation, we'll discuss what Elsevier is doing to maintain and improve the reliability of research and talk about practical steps researchers can take to make their own research more robust, as well. Join us for a step-by-step demonstration of how to use Mendeley as part of a systematic review process. Amanda will guide attendees on how to approach a systematic review from start to finish using Mendeley and other relevant content platforms. Document sharing can be a challenge when research collaborators are scattered across the world. Learn how a Mendeley private group has become the perfect solution to build a collection of shared documents for a trauma surgeon who deploys medical fellows and students to build trauma teams in developing countries. Join expert medical librarian Amanda Horsman and Doug Felder from Mendeley for an exclusive webinar focused on how librarians like you use Mendeley Institutional Edition to support students and researchers. Amanda will demonstrate the power of facilitating inter-professional collaboration between research group members. Mendeley Product Manager - Matt Green will be providing the latest updates coming to Mendeley Institutional Edition. Mendeley Certification Program for Librarians was launched in February 2015 and has received enthusiastic support from over 800 participants world-wide. The Certification Program offers an flexible, 100% on-line, self-paced learning structure in a 3-leveled structure for librarians to learn about Mendeley, functionally, technically, as well as the optimal user roll-out method at their institutions. The program is designed to not only bring updated information about the product to new users but also best practices to seasoned librarians. This webinar will feature librarians from both Helsinki University and York University and their experiences and learnings through the program as well as applying Mendeley in their own environments and library strategies. Massachusetts Institute of Technology (MIT) is one of the world’s leading universities in the areas of science and technology. The MIT Libraries Personal Content Management team supports students and researchers in the use of Mendeley and other tools. In 2013, the libraries decided to purchase and implement Mendeley Institutional Edition (MIE). MIE has enabled the Libraries to better support our users in their research by providing them with enhanced productivity and collaboration features. In this session we will discuss the MIT Libraries’ decision to implement MIE, how the Libraries were able to successfully roll MIE out to the MIT Community and how MIE fits in with the suite of tools that the Personal Content Management Team supports. In this webinar, you will learn about the reasons for ETH-Bibliothek Zurich to implement Mendeley, in particular Mendeley Institutional Edition (MIE), at ETH Zurich in Switzerland. ETH Zurich is one of the leading international universities for technology and the natural sciences. After one and a half years, we are looking back on our experiences with Mendeley and how it has been welcomed among the researchers and students. As librarians, we are able to further evaluate the benefits and visibility that MIE offers and what challenges we have met and overcome so far. In summary, we will also take a look ahead at our plans and wishes regarding MIE for the upcoming years. 2 years after joining the Elsevier family, Mendeley’s co-founder Jan Reichelt reflects on the journey and more importantly shares his vision and passion for the future to come. Since acquisition, Mendeley has not only accelerated its speed to deliver user-demanded features for its millions of users, but it has also worked feverishly to integrate itself with the rest of Elsevier solutions. This webinar will highlight how Mendeley is connecting to the rest of Elsevier solutions as well as how Mendeley is intending to deliver even more features and services to support researchers and institutions world-wide in 2015. Join this webinar will feature: Latest study on researcher interactions on Mendeley network and two users on how Mendeley supports discovery of new insights, easy to use annotation and cross collaboration, and sharing knowledge. You will hear the details of the study and why researchers choose to be on Mendeley to connect with others. You will also hear about some of the common traits of successful Mendeley groups and the people, content, and discussions. Lastly you will also hear about real users further advance their quest for scientific advances using Mendeley groups. You will also be the first to hear about some of the new ideas being tested and if you are a Mendeley user we would like to invite you to cast your votes for your favorites. .
Join this webinar featuring three experts including: A Mendeley product management and two seasoned researchers on why it is critically important for Mendeley to be secure and work smart proactively to support them in their research work. You will hear about the benefits of being able to organize and access your research library within seconds anywhere you are and how Mendeley can generate new recommendations for you to review. You can hear about how students and researchers use Mendeley to connect with others to gather knowledge as well as form groups to share insights. Lastly, you will also hear about why the millions of users trust Mendeley to transport their libraries as they advance through their careers. Join us to hear about some of the new ideas being tested and if you are a Mendeley user we would like to invite you to cast your votes for your favorites. Join this complimentary webinar to hear about how the library team at Stanford University selected Mendeley, an evolutionary reference management tool connected to one of largest academic social network, to deploy to its researchers and faculties. In one year, more than a thousand researchers have joined Mendeley group @ Stanford and using it to support their research collaboration and studies. This session will have an overview of how the library has taken on the initiative and how the students and researchers have embraced the new researcher's tool to support their work.